The date is 12 April 2009. There are five minutes left to play in the Heineken Cup quarter-final between Harlequins and Leinster at Twickenham Stoop. Williams was banned for a year, although this was later reduced to four months. Charles Jillings, the club's co-owner, resigned as chairman. Ten years on, this is the story of 'bloodgate' told by Williams and two team-mates on that day, Danny Care and Ugo Monye. Williams: I was about to run on to the pitch and the physio said: 'Deano says you're coming off for blood.' That was the first I'd heard of it. I just ran on the pitch and got on with my job. A few phases later, the physio runs on and gives me a blood capsule and I was like: 'What the hell do I do with this?' He told me to go into contact, put it in my mouth, chew it and go down. 'We'll get you off,' he said. Monye: Hand on heart, I didn't have a clue what was going on at the time. But I did know blood capsules were a practice at Quins. It was common in rugby back then. You reflect on it now and it was pretty stupid, but it was easy to get away with it. Monye: It just depended on who you needed to get on to the pitch. You never had conversations in the week and it wasn't a case of 'oh by the way it might be you', it was something that was just done on the hoof. Fortunately that day, it wasn't me who was asked to do it. If Dean had asked me to do it, because it was so commonplace, I probably would've done it too. It almost became normal because we'd done it a few times and in rugby that's just what was done. Care: Everyone would have done the same. If you get told to do it, you do it. Especially when it's Dean Richards telling you to do it. Williams: Nothing crossed my mind when I got handed the capsule, I was doing what I was doing for the team. I was trying to impress my boss and get Quins into a semi-final of Europe. It was about doing what I could for the team and not having thought in the slightest about the consequences. So what was I most guilty of at the time? Probably following team orders and being a naive 25-year-old who should've known better. Dean Richards returned to coaching with Newcastle in 2012 - showing contrition over 'Bloodgate' by saying: "I shouldn't have done it." Williams: The wink was ironically quite innocent. It was someone asking me if I was OK and it was me saying: 'Yeah I'm fine.' That was it. Care: That's why it looks so bad because the wink looks like it was all part of the plot, but it wasn't at all. What happened in the changing room? Williams: We knew we had to do something, as people wanted to come in the room to see my mouth. They were banging on the door trying to get into the changing room. Our doctor, Wendy Chapman, and myself, didn't know what to do. It was a really ridiculous time and I realise I looked like an absolute idiot. Shane Horgan had shouted from the Leinster bench, 'It's not real blood, it's not real blood' as I was stumbling down the tunnel. So we went into the changing room, I had a conversation with the doctor and she made the cut. Logical decision making at the time, for myself and Dr Chapman, was just not there. What happened in the aftermath? Eventually my wife Alex and I went to meet the board and the chairman one night and we spent three hours going through the possible outcomes. Monye: Everyone in the aftermath was thinking about the individual, the team and the club. Williams: I thought long and hard about taking the fall. Monye: What changed your mind? What did the other players think? Monye: If we're speaking truthfully, the players were massively divided. There was a part of me that was like: 'Tommy, just take the hit.' He'd have been a hero among us because he'd have fallen on his sword. We wanted to protect the reputation of the club. Selfishly we were just thinking of how we could protect everyone involved in it but it was an impossible solution and about damage limitation for us. Care: We didn't know what blame Tommy was getting. Williams: I knew the issue the players had. It was similar to the internal issue I had myself in terms of the wider picture. A couple of players were saying to me in passing 'loose lips sink ships' but that's just childish bullying essentially. They were very loyal to Dean and just looking after their friend's best interests. Williams: It was a difficult situation because I wanted to play rugby but there was a little something attached to my name which made most clubs not want to employ me. I did look elsewhere but I didn't get very far down the line. My agent just said no-one was interested. I was pretty ill during that four-month ban and these days it would probably be diagnosed as depression. I lost two stone and I thought: 'What is it that I'm playing rugby for?' I just wanted the opportunity to come back and find some pride in myself, and hopefully give some back to Quins as well. Williams: That day hasn't been away from my thought process ever since that moment it happened 10 years ago. Inevitably there's a stigma that's still attached to my name now that's no longer attached to Harlequins. Every time Harlequins are written about in the papers, it doesn't say 'bloodgate', does it? Every time I'm written about in the papers, it says 'bloodgate'. So who's got the stigma? Yeah, I'll take that it could've been worse. But it doesn't get much worse than people turning up in vampire outfits to Twickenham the next season. It doesn't get much worse than turning up at Sale and people calling you a cheat. How much worse could that get? 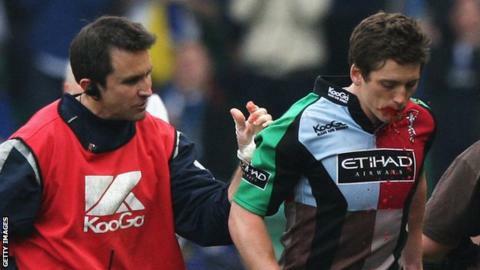 Monye: 12 April 2009 was undoubtedly the darkest day in Harlequins history. We lost a lot of great women and men from that and the club's reputation was tarnished, but off the back of that we were able to find the strength to block out all the exterior noise and get back to what we were. No-one will understand how bad it was, though, more than Tommy. I'm just glad in some ways that we got caught because it cleaned up rugby, and to my knowledge it's not been done since. Care: It was a massive wake-up call for rugby and definitely for Harlequins. We faced an unbelievable punishment, people lost their jobs and Quins can't ever have anything like that on their name again. For the club, the best thing was that we got caught but for Tommy, it was the worst.